The UK retail market has been hindered by slumping consumer confidence, stemming from inflation and stagnant wages. Still, total retail sales will increase 2.9% this year, with ecommerce driving much of the growth. eMarketer expects UK retail sales will top £427.67 billion ($577.23 billion) in 2017. According to one study, UK consumer spending has fallen to its lowest point in nearly four years. As budgets tighten, consumers are spending less on luxury products and focusing on essentials. Retail ecommerce sales in the UK will climb 14.5% this year, totaling £81.55 billion ($110.07 billion). Digital’s share of overall retail sales will continue to grow, jumping from 19.1% in 2017 to 25.2% in 2021. Digital shopping and buying is widespread in the UK. Approximately 42.9 million people in the country will make at least one purchase digitally this year, while the number of digital shoppers—those who look for or research purchases online but don’t necessarily complete a transaction—will reach about 45.2 million. These totals will represent roughly 80% of the UK’s population. Consumers are increasingly buying via mobile devices. This year, UK retail mcommerce sales will reach £35.31 billion ($47.66 billion), up 28.4% from 2016. Double-digit growth will continue throughout the forecast period. 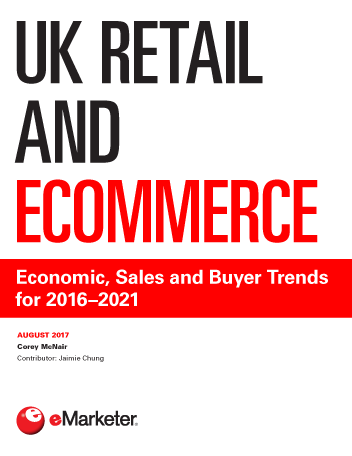 "Retail ecommerce sales in the UK will reach £81.55 billion ($110.07 billion) in 2017, accounting for 19.1% of total retail sales. By 2021, that share will rise to 25.2%."